• Create a sacred space by building a sense of sanctuary in your home, garden or office. Light a special candle or burn incense that reminds you of an infinite spiritual healing power. • Consecrate the space with music, prayer, dance, drumming, chanting or sacred images. Call upon the help of the Creator, angels, ancestors, healing guides, teachers or spiritual allies. • Place a photo or painting of a spiritual teacher or helper in a prominent place. • Frame a poem, prayer, or writings from a sacred text. 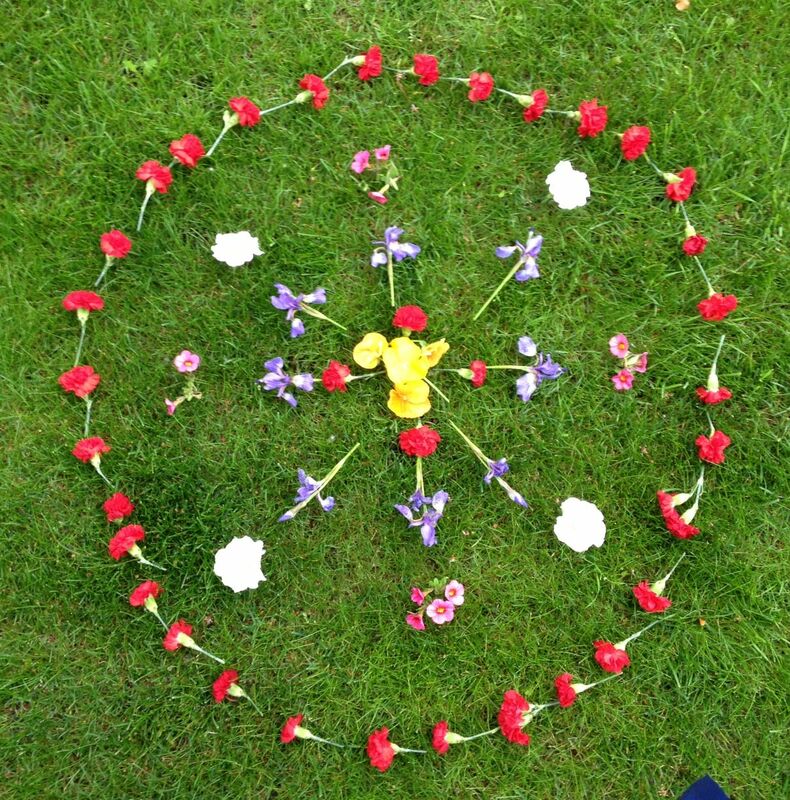 • Build a Medicine Wheel, altar or labyrinth (if outdoors). • Focus on an inspirational object: a talisman, power piece, or an object of beauty. 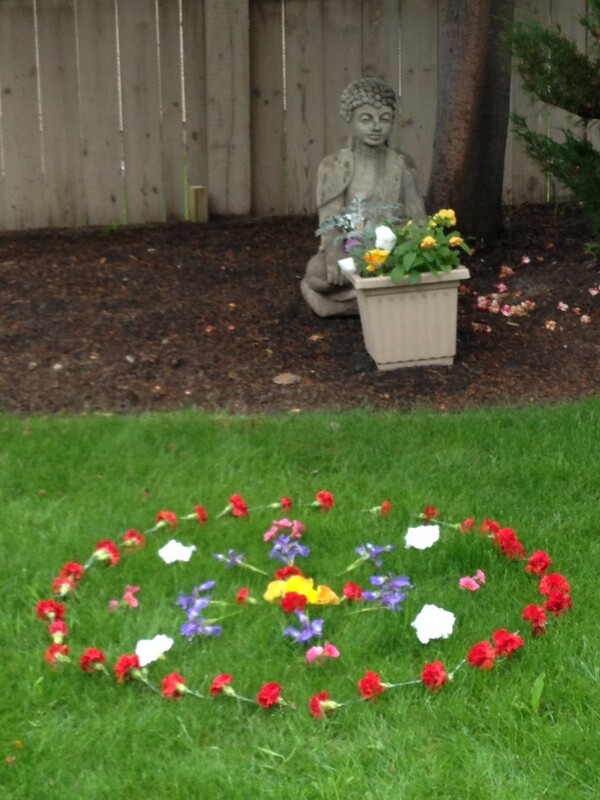 Thank you Martina for sharing your sacred garden and beautiful flower mandala. Your garden reminds me of how, even as children we often find a special place–a place where we can just ‘be’. As adults we sometimes need to make time to create what is so natural to us in childhood. . When I was 10 years old, I was drawn to trees. . I would play for hours near the old Oak in our yard. . .and a towering evergreen tree in front of our elementary school became one of my best friends. It was a beautiful, old pine tree with low branches. The smell of fresh pine sap, the sunlight filtering through the needles and branches–all this added to the magic and mystery of losing myself in the branches. I would watch the world from my secret place, my perch higher up, above the ground. That tree offered me sanctuary and perspective, when ever I needed it. When I moved to California as an adult, the Redwoods became my brothers–6 sentinals standing tall, guarding my front lawn and watching over the whole hillside. Even now, just thinking about them returns me to a state of peace. Now in Calgary, my morning cup of tea, while watching the bow river offers me the same solace.